WML is an XML language is useful to identify the content and used to specify content and user interface for WAP devices like PDA and Mobile Phones. The WAP forum facilitates the DTD for WML. 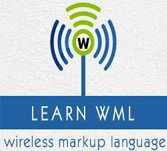 WML tutorial provides you complete understanding on WML language to develop WAP applications. WML tutorial is designed for Software Professionals who wants to become WML Programmers to learn WML Development. To learn this tutorial one must have a basic understanding of XML, text editor and execution of programs etc.